Still HOT! Happy Thursday. Where did the week go? Today's card is for the challenge at Just Magnolia. The challenge this week #63 is a recipe, three flowers, two papers and a ribbon. 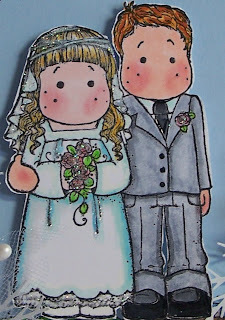 I've colored the Bride and Groom with Copics (doesn't it seem like just yesterday they were little children?). Edwin looks a little nervous! I used Stickles on Tilda's veil and gown. 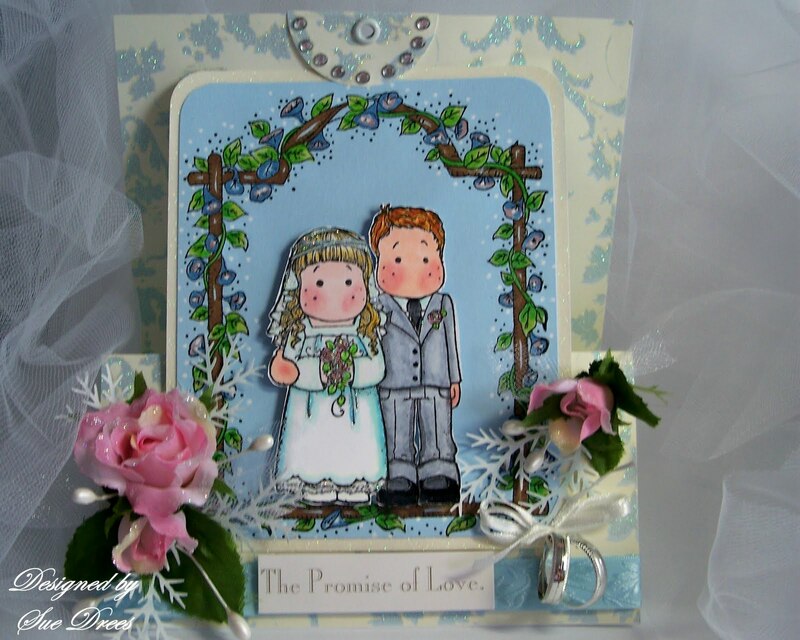 Paper for the card is from K & Company, Wedding. The words on the front of the card are from the same papers. 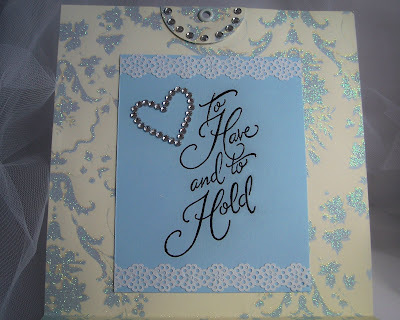 The blue card stock is Stampin' Up Bashful Blue. The Vine stamp is Stamps Happen. Flowers are pulled from a silk bunch. I also added Stickles Star Dust to them. 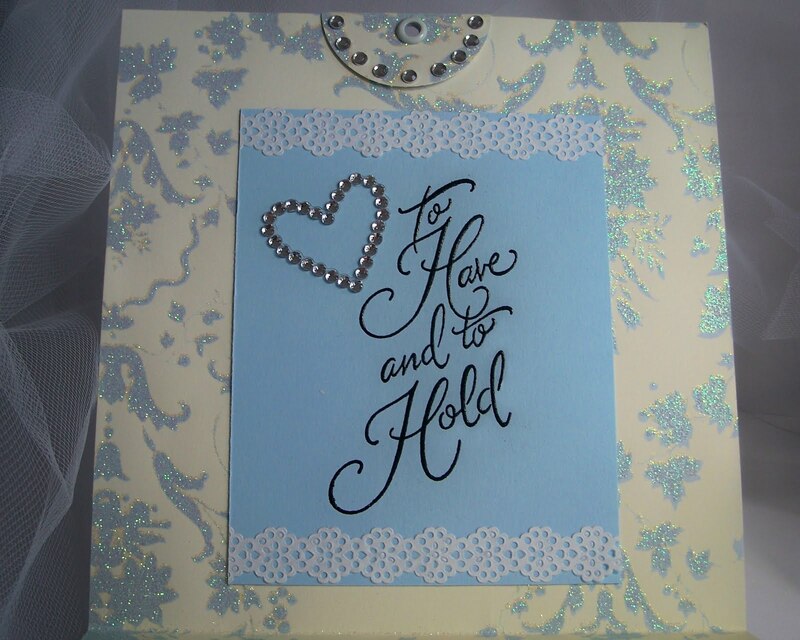 The inside sentiment is Stampendous. The rhinestone heart is from Michael's. The little rings are favors from the bridal section of the dollar store!! Love it! !Great coloring. 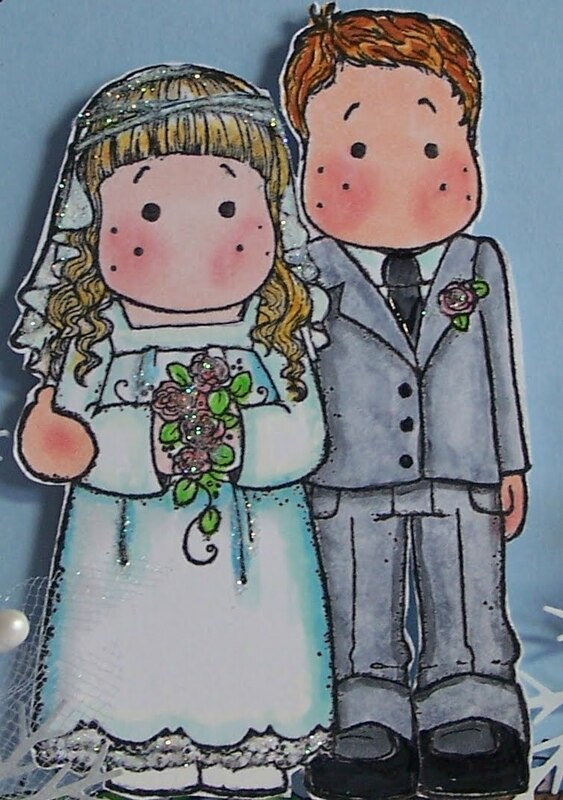 What number of copic did you use for the groom's grey suit? Oh my word Sue..this is gorgeous. I just love the work you put into this beauty! Love those rings you attached, such a great idea! so very cute...and yes,,,they grew up so very fast LOL! Beautiful card Sue,i love the image and your papers. with just that simple recipe for the challenge, you have cooked up an extraordinary piece of art!